Even from just what we've posted about Salvador Dalí, you can tell he had a mission to spread his distinctive sensibility far and wide: he made films with Luis Buñuel, collaborated with Walt Disney and Alfred Hitchcock, showed up for Andy Warhol's "screen tests," and illustrated some of the best-known texts in western history, like Dante's Divine Comedy, Lewis Carroll's Alice's Adventures in Wonderland, and Shakespeare's Macbeth. All those projects might seem well suited to the Spanish surrealist's famous skill at artistically rendering the torn edges of human consciousness, but what would he do when presented with something more psychologically straightforward — Romeo and Juliet, say? 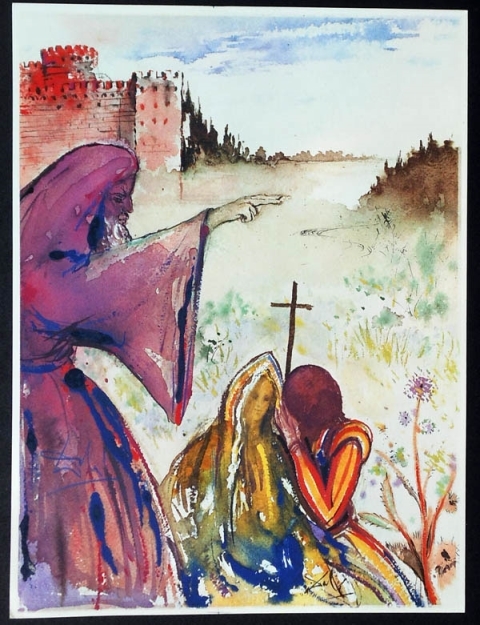 You can see the results of just such a project at Twisted Sifter, which presents ten notable illustrations from Dalí's second Shakespearean project. These images come from a 1975 Rizzoli and Rizzoli edition consisting of "ten off-set lithographs on heavy paper with 99 pages of bound text contained in a red/burgundy silk slipcase with the lithographs signed in the place." 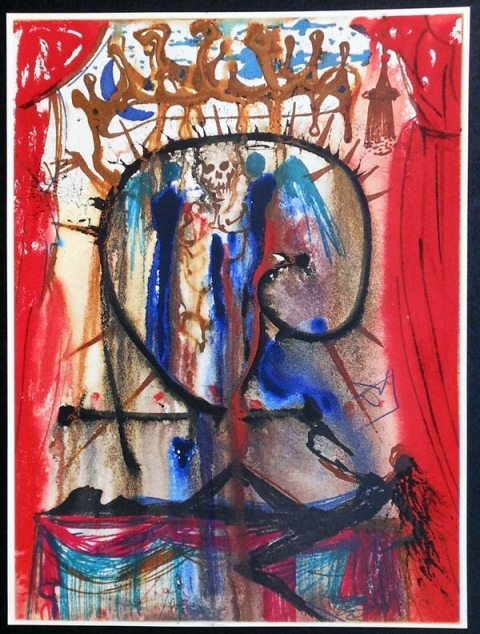 You can find out more about this book at the site of Plainfield, Illinois' Lockport Street Gallery, which offers the copy for sale and a warning against all the "fake prints" (inauthentic Dalí having long constituted a robust industry of its own) in circulation. Romeo and Juliet, perhaps due to its tendency to get assigned in high school, can come off as one of Shakespeare's milder, more familiar plays, and modern interpretations of the material fall flat as often as they rise up to it. But Dalí's contribution makes the old tale of star-crossed lovers strange and haunting again — exactly the specialty, I suppose, that would attract anybody to him with an offer of collaboration in the first place. I’m completing my MFA in Writing (Poetry and Short Fiction) and finding these images just inspired a poem. 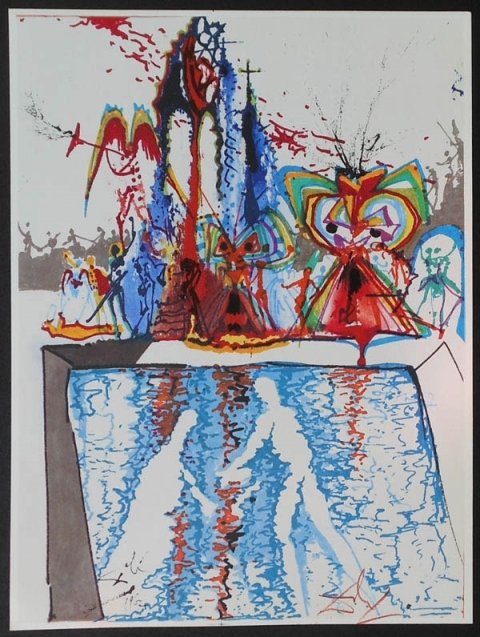 Not the first work triggered by Dali that I’ve written, and hopefully not the last. Thanks so much! YES VERY RARE PIECES. ALTHOUGH, I HAPPEN TO HAVE AN ORIGINAL OF ONE PRINT, AND IT BEING ONE OF TEN IN THE SUITE TO BE HAND SIGNED BY THE ARTIST. I HAVE ROMEO AND JULIET (ACT I, SCENE IV).